Pygora Projects: Knit, Felt, Crochet! Welcome to Gun Plain Pygoras! We raise and sell Pygora® goats on our farm in southwest Michigan, and also sell luxurious pygora yarn and dehaired pygora roving (see Pygora Yarn & Roving for Sale page). 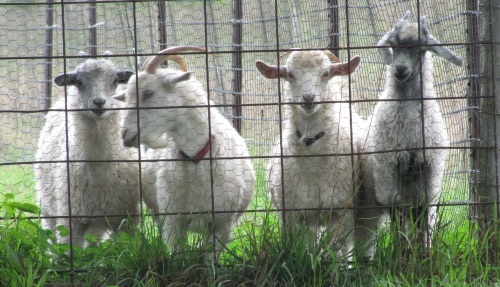 Pygora® fiber comes from a goat breed derived from cashmere producing Pygmy goats and mohair producing Angora goats. Pygora fiber comes in a variety of colors, and is truly unique – fine and soft like cashmere, lustrous like mohair, and when knitted or crocheted, Pygora yarn “blooms” with a lovely halo, similar to that for angora yarn. To see what it looks like in a finished handknit piece, and get an idea how far this yarn goes, check out our Pygora Projects page. All kids will be microchipped, vaccinated and pre-registered. For people who are some distance away, we will air ship, or we can deliver or meet you with in a 350 mile range from Kalamazoo, MI. Our herd is CAE and Johne’s free. Record keeping supported by FlockFiler.